Journalists Erika Allen (second from left), Lauren Duca (second from right) and Megan Twohey (far right) talk at a CTSS event Thursday. The panelists addressed the role of social media in the #MeToo movement. As Megan Twohey, an investigative reporter for The New York Times, was preparing to publish allegations of President Donald Trump’s sexual misconduct, she said Trump told her she was a “disgusting human being.” She said the incident made her wonder what it meant when someone like him is elected president. 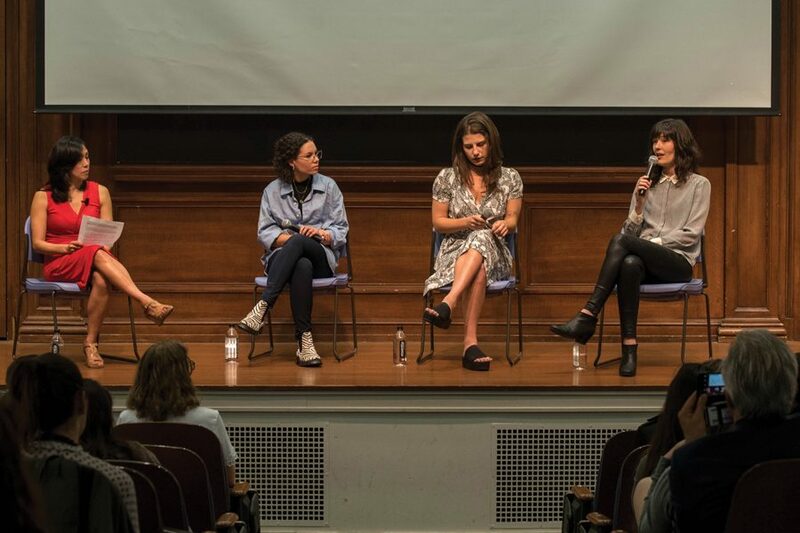 Twohey, an Evanston native, joined Lauren Duca, a freelance journalist and columnist for Teen Vogue, and Erika Allen, managing editor of The Outline, in speaking to a crowd of about 50 about the success and repercussions of the #MeToo movement. The Thursday event, hosted by the Contemporary Thought Speaker Series and co-sponsored by the Medill School of Journalism, was moderated by Medill Prof. Mei-Ling Hopgood. After public revelation of Weinstein’s past, actress Alyssa Milano popularized the hashtag #MeToo, which was first used by activist Tarana Burke. The use of #MeToo triggered a surge of responses from other women — among them celebrities including Gwyneth Paltrow and Jennifer Lawrence — and sparked a transnational movement. Duca said the #MeToo hashtag helped empower victims of sexual abuse. When confronted with the question of why seemingly fewer women came forth before the popularization of the movement, Twohey said there have always been systemic failures in the criminal justice system that work to silence and dismiss the women who come forward. Powerful attorneys helped men orchestrate payoffs to women that prohibited them from warning other women about the violations they had experienced, Twohey said. “The more pressing and urgent question here is: What are the systemic solutions that need to take place?” Twohey said. Duca said social media offers a more “democratic” forum that allows women’s voices to be heard, but the absence of traditional “gatekeepers” can spark paranoia among men who fear being accused. However, Twohey said The Times always applies “high standards of due diligence” to reviewing a wide range of evidence before publishing any allegations. Allen also said that a journalist must “investigate” and “verify” before publishing any claims. “Our job is not just to listen, but to try to tell the whole story,” Allen said. CTSS vice president Amanda Gordon told The Daily that the group reached out to speakers who have a variety of journalistic experiences. Gordon said the “cutting-edge” style of The Outline, Duca’s ability to mesh pop culture with activism and Twohey’s investigative approach complement each other well.